Satsuma One is a large, modern studio apartment, decorated with luxury and conveniently located near Prince Charles Drive, inspiring design ideas of making royalty accessible. It boasts beautiful marble floors, granite counter tops, stainless steel appliances, with an attractively stained wooden ceiling. The le-grande king bed and hotel-suite-quality sofa-bed easily accommodate up to four guests and are so comfortable you’ll fall asleep with a smile. Satsuma One has a full sized kitchen for making inspired meals, and of course all dishware and cookware are included. Creature comforts include central air conditioning, ceiling fans, flat-screen tv with cable, free internet and WiFi. Behind the quad french doors you’ll be tempted to take a dip in our wading/standing pool outside. 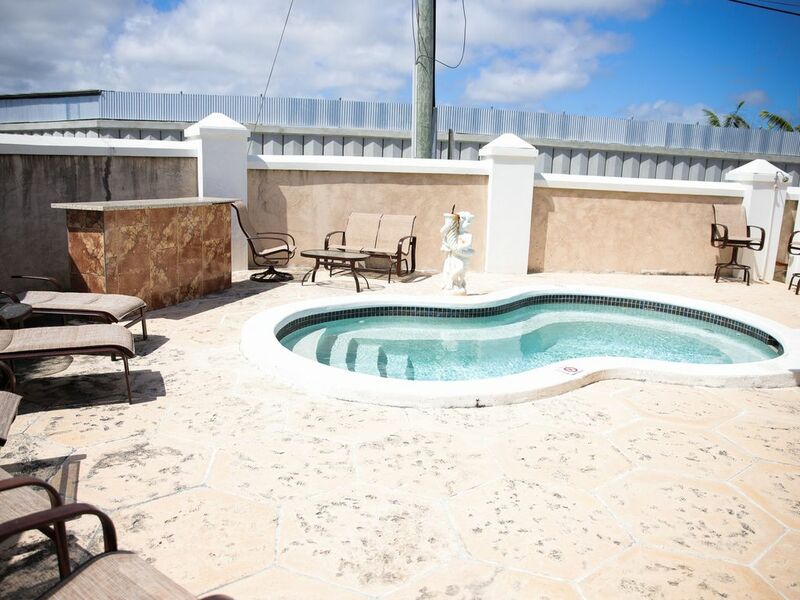 Too small for swimming but at 6ft on the deep-end with sitting levels all around the pool, it’s a great way to relax on a summer’s day with your favorite Caribbean beverage as you chat and chill and enjoy your time doing nothing in The Bahamas! On the pool deck there are also plenty of lounge chairs, a bar table to prepare some outdoor meals and a BBQ grill to ensure summer fun year round. Securely located in a small, private, gated complex near the eastern side of the island, it’s also conveniently located near public transport (3 mins walking), as well as several small shopping centers, grocery stores, local and fast food restaurants, wines and spirits stores, ATMs and even a gym, all within less than 5 minutes walking. Heading to the beach or wanting to enjoy amazing sunrises? Be there in less than a 10 minute drive. And most importantly you’d be staying at a Tangerine Sunsets vacation property, which means you’ll benefit from our well known standards and services. You’ll also have priority access to our team throughout your entire stay to help you have a fantastic vacation, which is always our #1 goal. We’ll be happy to arrange airport transportation, super convenient car rental, tours and excursions and a host of other services with your confirmed booking. A relaxing wading / standing pool. It is too small for swimming.